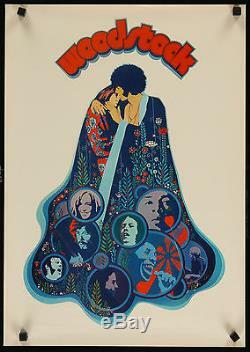 Original, unfolded, first release GERMAN poster for the 1970 film "Woodstock". Classic artwork by the legendary illustrator and poster artist Richard Amsel. Film Description: Woodstock, the classic 1970 Michael Wadleigh documentary of the legendary rock'n' roll (rock and roll) music concert festival "peace"; "people"; "love"; "grass"; "music"; "America"; Three days of peace, music... And love"; "No one who was there will ever be the same. The movie"; "Sit on" featuring musicians Joan Baez, Joe Cocker, Country Joe & the Fish, Crosby, Stills & Nash, Arlo Guthrie, Richie Havens, Jimi Hendrix, Santana, John Sebatian, Sha-na-na, Sly and the Family Stone, Ten Years After, the Who, and "400,000 other beautiful people. NOTE: PLEASE IGNORE THE BLACK MAGNETS IN THE CORNERS: THEY ARE USED DURING THE PHOTOGRAPHIC PROCESS AND AREN'T PUSHPINS, HOLES OR A DESIGN ELEMEN. PLEASE SEE OUR OTHER AUCTIONS AND STORE ITEMS FOR COOL MOVIE POSTERS. It must come back in the same condition as it was sent. FILM/ART has one of the finest collections of original movie posters. The item "WOODSTOCK 1970 original unfolded 16x23 movie poster Richard Amsel art" is in sale since Thursday, September 05, 2013. This item is in the category "Entertainment Memorabilia\Movie Memorabilia\Posters\Originals-United States\1970-79".